Hi Lovelies! I'm here today to share with you a cover reveal for an upcoming novel by C. Sharp courtesy of Diversion Books called The Elementalists! This one looks like it is going to be a really fun read! All seems normal in small town Virginia, where fifteen year old Chloe McClellan dreads the start of her sophomore year. Whip-smart, athletic and genuine, she’s also a bit of an angry loner who is totally unaware of her charms. Despite her plans to stay under the radar, Chloe becomes a target for the fiery queen of the It-girls in fifth period gym. She then draws instant notoriety when she’s struck by lightning after her first disastrous day of school. As if that weren’t bad enough, she soon comes to believe, that either she’s going insane, or her accident has unleashed a powerful and terrifying creature from the mythological world—triggering the final countdown to the world’s sixth great extinction level event. Chloe finds some solace as she inexplicably wins the affections of an unlikely trio of male classmates: the earthy and gregarious captain of the football team, the flighty stoner with a secret, and an enigmatic transfer student who longs for the sea. All the while she struggles with the growing realization that “Dragons” exist, and she may be the only one who can stop them. 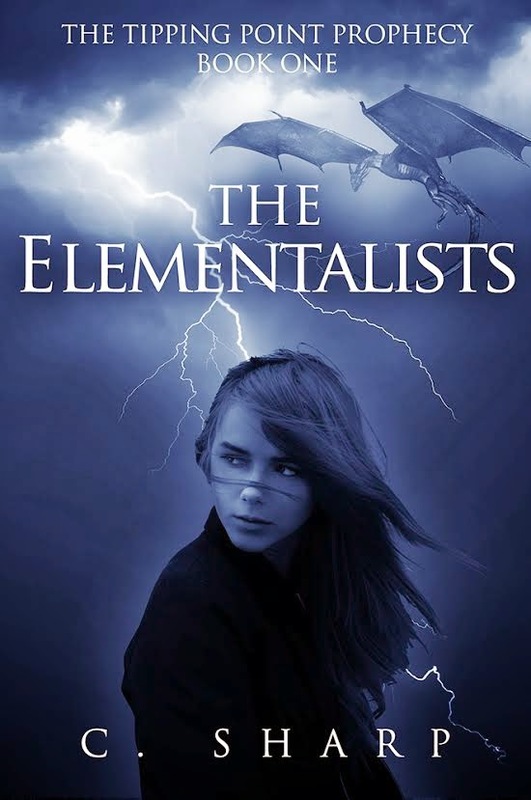 The Elementalists, book one of the Tipping Point Prophecy, follows Chloe and her group of friends, and enemies, as they struggle to save humanity by harnessing the power of the elements. This is C. Sharp’s debut novel. He studied English Literature and Anthropology at Brown University and Mayan Archaeology at the Harvard Field School in Honduras. He works in film and commercial production. Chris now lives in Concord, MA with his wife and daughter. I know that this looks like it is going to be a great read, if you're into mythological reads-- check this one out!